One of the greatest conmen of the twentieth century was Victor Lustig, who became known as the man who sold the Eiffel Tower. 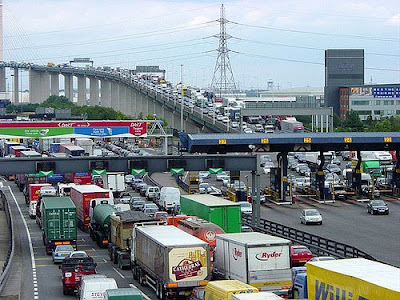 Gordon Brown is about to repeat the same trick by selling the Dartford Crossing. When the QE2 Bridge was opened in 1991, the public were told that the toll would be charged for only as long as it took for the construction costs to be recouped. The debt was effectively paid off in March 2002, yet Labour has not only continued to charge us, but they actually increased the toll by 50% in 2008. It is now reported that Gordon Brown wants to sell off a number of state assets - including the crossing - to plug the gaping hole in the public finances caused by his reckless and irresponsible management of the economy. A private owner will obviously continue to charge drivers for ever and a day, yet anyone who uses the crossing (or listens to traffic reports on the radio) will know that the whole area is a regular bottleneck during the morning and evening rush hours caused by congestion at the toll booths. This causes massive damage to the environment and the economy, as well as frustration for drivers. Earlier this year, a Department of Transport spokesman said: “Having charges helps tackle congestion…” which is absolute nonsense because motorists have no alternative but to use the crossing. If the tolls were removed, the congestion would vanish. Unfortunately, Gordon Brown prefers the option of making our money vanish instead.